Doctor, here’s the harsh reality: You will always (and only) be as good, strong, productive, effective, efficient, and successful… as the TEAM that you work around and who supports you every day. Most Dentists are left to accept the “default mode,” the status quo, the same-as-always results of mediocrity from their teams and they live forever held back… unable to achieve their fullest potential because they’ve given up on believing it can be different. But I have good news. It can be different. It doesn’t have to be this way. 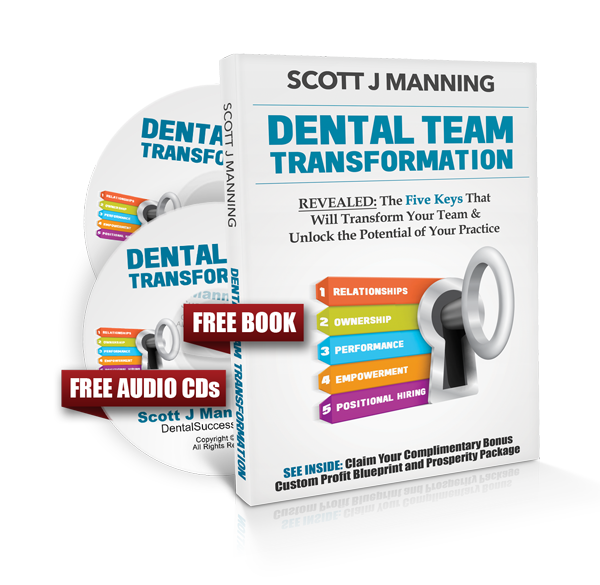 Because all of that is about to change… in this FREE BOOK & AUDIO CDs, I will walk you through my specific process for Team Transformation and Practice Alignment to propel and accelerate you and your team to new levels of efficiency, productivity, and RESULTS. This, above all else, will be the rising tide that lifts up every part of your Practice. No marketing, technology, online gimmick, bright shiny object piece of equipment, goofy hyped-up industry trend, or anything else will ever make a more dramatic impact on your Practice… today, tomorrow, and for far into the future… than what I’ll be sharing in these resources. IMAGINE: Your Team – FULLY Empowered - each and every individual… position by position… person by person… every one of them eager to pick up the ball and run with it, to own their role, and to passionately fulfill their responsibilities, perform above your expectations, and be held accountable. All without the need for Micro-Managing or Constant Oversight. Because NONE of that works…surely you’ve been there and tried all of those things before. What I am here to do is to challenge your thinking, give you a fresh perspective of how the highest-per-Team-member Collections Practices in North America are getting the job done. Choosing Team Leaders who feel motivated, inspired, and empowered to help your practice hit ever increasing targets of opportunity. The ultimate hiring process for maximum results and finding the perfect fit for YOUR practice. Keys to turning EVERY team member into a TOP producer you can rely on day in, day out. 5 steps to a Self-Managed Practice… imagine the relief knowing that things will “JUST GET DONE” without you ever having to intervene. Balanced management - without being over-bearing or negligent. Removing daily operations from your life, completely… FINALLY you’ll be able to focus on ONLY the tasks you want. What to do when you are frustrated and how to overcome those feelings and channel them back into your true passion. All you need to do is fill out the form below and click the button and we’ll send everything to you immediately. I’m ONLY sending this package to the first 100 Dentists who request it… and there are 10’s of 1000’s who read and follow and study and hang on every word I write each week. This is for serious Practice Owners who really have the ambition to make this work and enable their practice and their team to do amazing things. So if you are satisfied with just a million-dollar practice, and you find working 4-5 grueling days a week of high volume patients all by yourself exciting, then please don’t bother – this isn’t for you. On the other hand: If you value lifestyle, peace of mind, believe you deserve to make a lot of money, and you understand the importance and necessity of others doing work for you… and if you truly want to build, create, sustain a winning team, a practice organization… then you won’t want to miss this. You might be overworked and underpaid, stressed out because you feel like you are carrying the weight of every day, every dollar, and every patient on your shoulders. Your Team might be long-tenured, stuck in their ways, and have achieved an all-time high of complacency where they’re simply showing up to “work” - living their job without much care or concern for where your practice ends up. You might have a young team, a team with high turnover, a team without much direction. They might or might not want to do well, take initiative, do what you want, but regardless they’re almost certainly confused about where to start, wet behind the ears, and desperately in need of structure and systems. You might have an amazing team ready to explode with potential, you might lack management or leadership skills or both and you know having an outside perspective to liven things up take you to the next level and open the minds of your people to the possibilities and arm them with a plan to get where you want to go. IF you are looking for growth or to exit, YOUR TEAM is the secret to providing you the lifestyle you want and the peace of mind you deserve. YOUR TEAM ultimately determines the paycheck you write to yourself every month and the amount of money left over to stash away, go on vacation, pay for your kids college, or to compound your wealth. Or instead do what it takes to transform and align them to help you achieve your goals and the vision and mission and purpose of the dream practice you have always wanted and the financial ambitions you deserve. This WILL be a turning point in your career. And as you look back on this book and set of audio CDs, you’ll see that the formulas shared, information revealed, and this entire experience with me truly changed everything. It will be the day that led to finally getting everyone on the same page, moving in the same direction, with each Team Member leading the charge… instead of standing behind you waiting to be directed. IT ALL COMES DOWN to your ability to lead, empower, manage, and guide them to victory on a patient-by-patient daily basis – with the proper structure, incentives, practice model, and strategy to maximize your potential every day. 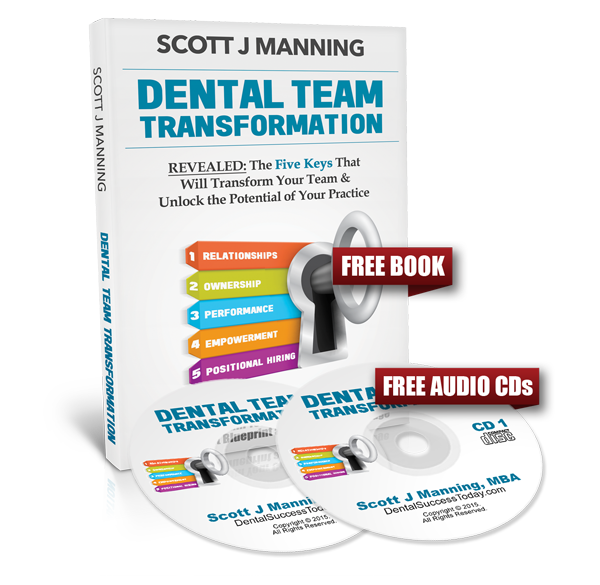 Don’t delay the powerful transformation your practice needs - fill out the form below and click the button to get your copy of Team Transformation and Practice Alignment NOW.